If you ask most Americans where to find the biggest Carnival, they’ll tell you Rio de Janiero. Ask most Brazilians and they’ll probably say Salvador. Since I’m a music lover, I decided on Salvador for my first Carnival in Brazil. I traveled with two friends, and after a 10-hour overnight flight, we arrived in Salvador on an early Thursday morning in February. We grabbed our luggage, breezed through customs, and headed outside to catch a cab to our rented apartment in the Correador Vitoria. When we arrived, we were pleasantly surprised by the modern lobby and the great pool/sun deck with gorgeous views of All Saints Bay. Even though we were dog tired, we were too excited to sleep. We dropped off our bags, walked around the neighborhood, and stumbled upon a por kilo restaurant. The restaurant had a steady flow of people (which we took as a good sign) and a smorgasbord of food, including several Brazilian dishes. I had my first taste of feijoada, a bean stew which is Brazil’s national dish. It was delicious. When we returned to the apartment building later that afternoon, the Carnival route had been blocked off and the security was tight. We learned it was because the Campo Grande circuit passed directly in front of the building. The apartment turned out to be in a great location because it was relatively close to both the Barra and Campo Grande circuits. You could feel the excitement in the air as crowds started to congregate and stake out their favorite spots. Although I had watched videos on YouTube, it didn’t prepare me for the energy and vibe that is Carnival in Salvador. You have to be there to see and truly feel it! The festivities started early, around 6 pm. Since we were close, we went to both the Barra and Campo Grande circuits to get a feel for the routes. They were different, but both equally fun. The Campo Grande circuit was more gritty and seemed to cater more to the local crowd. 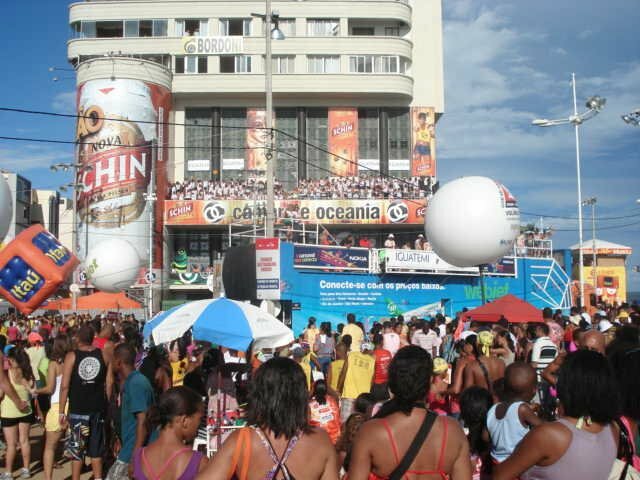 The Barra circuit seemed more commercial and touristy with plenty of advertisers among the throes of people. 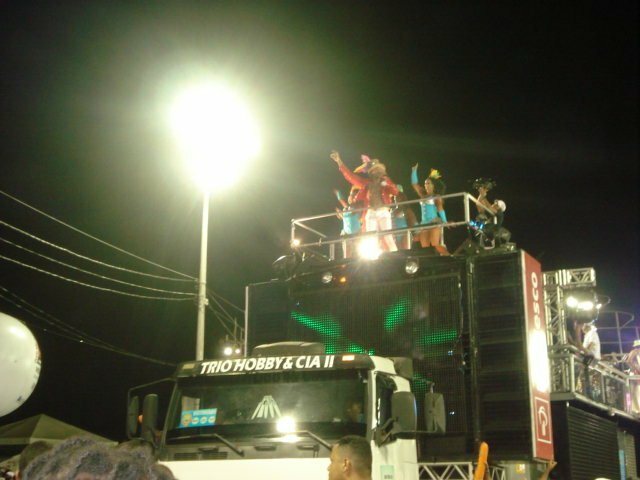 I was amazed by the large crowds and the trio eléctricos; I’d never seen speakers so large and loud. I guess music really is the universal language because even though the music was in Portuguese, I still enjoyed it. I got my first glimpse of the group Parangole (and their gorgeous lead singer Leo Santana). Their hit song, Rebolation, was a Carnival favorite and quickly became mine too. I was exhausted by midnight and called it quits early. But, the party was just getting started. Despite being on the 9th floor, I could still hear the music playing outside until around 5:30am. On Friday, we decided to go sightseeing in the Pelourinho. It was about a 20 minute walk from our apartment, which allowed us to see another part of the city. The route was a little seedy in some areas and we probably would have been concerned walking alone. But there were others walking too, so we went with the flow. Once we arrived at the Pelourinho square, we were greeted by a variety of street entertainers, including Capoeira performers and a Michael Jackson look-alike. After enjoying the show (and paying the obligatory tip), we took the Elevador Lacerda to the lower city and went to check out the Mercado Modelo. There were 200+ stalls of art, jewelry, T-shirts, and other souvenirs, and the place was bustling with people. We bought a few souvenirs, then headed upstairs for lunch at the Camefeu restaurant, which had gorgeous views of the bay. We wanted to try mocequa, so we ordered one chicken and one seafood dish to share. The food was good and the views were even better. We stayed for a couple of hours drinking caipirinhas and taking it all in. Later, we headed back to the upper city and walked around the Pelourinho to look at the architecture. We were also treated to some beautiful local artwork. Many describe the Pelourinho as a tourist trap (and it is), but there were also plenty of locals going about their daily business. It seemed to be the heart and soul of the city and we were so enthralled we had to go back. On Saturday afternoon, we returned to the Pelourinho. We stumbled upon a quaint restaurant, J & K, where we were treated to a good, cheap meal and live music performed by our waiter. He had a beautiful voice and truly seemed to enjoy entertaining us. We later bid him thanks and farewell, then walked along the steep, cobblestone streets of the Pelourinho where various groups were parading in colorful costumes. Before leaving, we visited the São Francisco church, known for its ornate gold walls and ceilings. Later that evening, we went to the Barra circuit. Saturday night really brought out the crowds; I’ve never seen that many people in one place. Everyone was singing and dancing in the streets and having fun. We met people from Brazil, France, Argentina, and Portugal. We stayed out until 4 am and loved every minute of it. This was the second of 7 nights of nearly non-stop partying. I averaged only 4 to 5 hours of sleep each night. On Sunday afternoon, we decided to experience the Pelourinho circuit. This route caters to families, so there were many kids. As we walked through the Pelourinho, we happened upon youth musicians of Olodum. Their drum beats resonated throughout the Pelourinho and attracted a growing crowd which followed them like the Pied Piper. These kids had amazing talent, performing choreographed routines with their instruments while never missing a beat. Later, we passed by the Filhos de Gandhy headquarters, where the men were dressed in their signature white and blue togas and turbans. They were a bit tamer than they had been the night before, exchanging beads for intimate kisses (ala Mardi Gras). By Tuesday, the last official day of Carnival, we were tired and decided to relax at the beach before the big night. 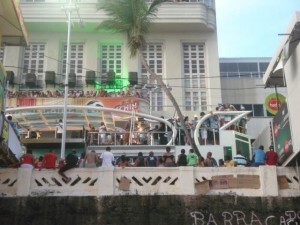 We took the bus to Itapua beach, laid out for several hours, then came back to town to get ready for the Barra circuit. We had splurged on Bicho bloco abadas, so we got dressed in our pink shirts and headed out for the fun around 8pm. When we got there it was already crowded and groups were congregating and waiting to join their blocos. We joined the other pink shirts, drank a few beers, and patiently waited. Finally, around 10pm the trio electrico arrived and we lined up inside the ropes to follow the truck along the route. It was jam packed with people (to the point of being uncomfortable), but the energy was electric. As the night went on, I looked around marveling at the people, the sounds, and the fun vibes. Brazilians really know how to party! Everyone should experience Carnival in Salvador at least once in life. 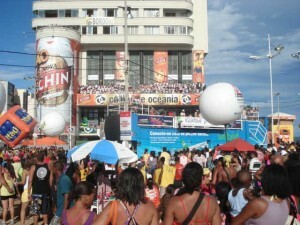 To learn more about Salvador and its Carnival, visit http:\\www.salvadorcentral.com.